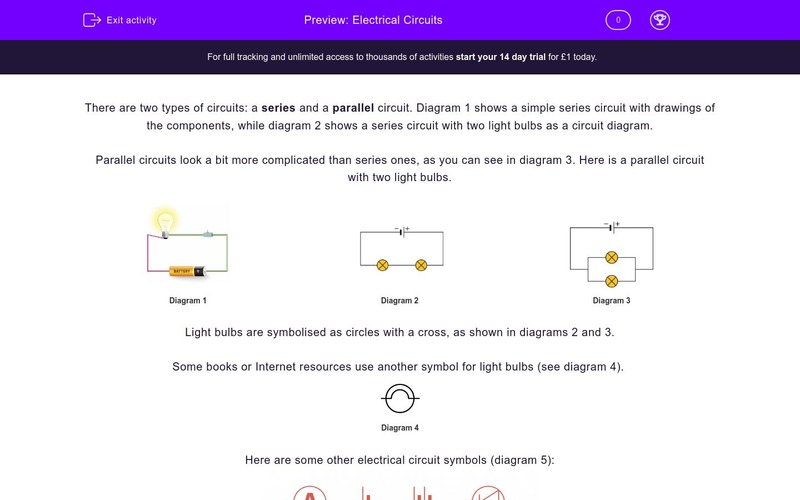 In this worksheet, students will read an introduction to electrical circuits. There are two types of circuits: a series and a parallel circuit. 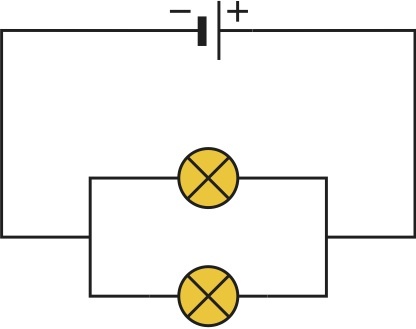 Diagram 1 shows a simple series circuit with drawings of the components, while diagram 2 shows a series circuit with two light bulbs as a diagram. Parallel circuits look a bit more complicated than series ones, as you can see in diagram 3. Here is a parallel circuit with two light bulbs. Light bulbs are symbolised as circles with a cross, as shown in diagrams 2 and 3. Some books or Internet resources use another symbol for light bulbs (see diagram 4). Wires are just represented as lines. In a series circuit, all light bulbs light together and if one breaks, a gap is created in the circuit, so none of them works. In a parallel circuit, the current flows along all branches. If one light bulb is broken, the others can still work. Christmas lights are connected in parallel. No one wants their Christmas lights off, because of just one bulb! In a series circuit, adding more bulbs would make all of them dimmer, because this would increase the resistance in the circuit. In a parallel circuit, though, if you add more branches with bulbs in them, they will all still be bright. Current is the same everywhere in a series circuit, but it splits up in branches in a parallel circuit. In the latter, current in all branches adds up to the current in the main branch. What is the main symbol for a light bulb in a circuit diagram? A series circuit has only one loop. 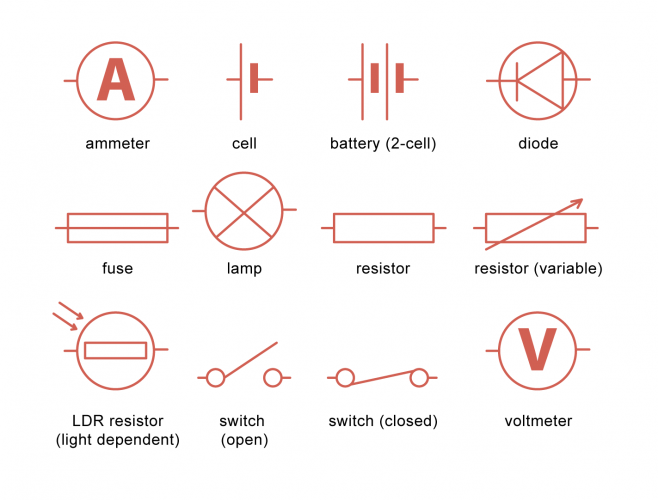 What is the symbol for an ammeter? Fill out the gap in this sentence. In electrical circuits wires are represented as _____________ . 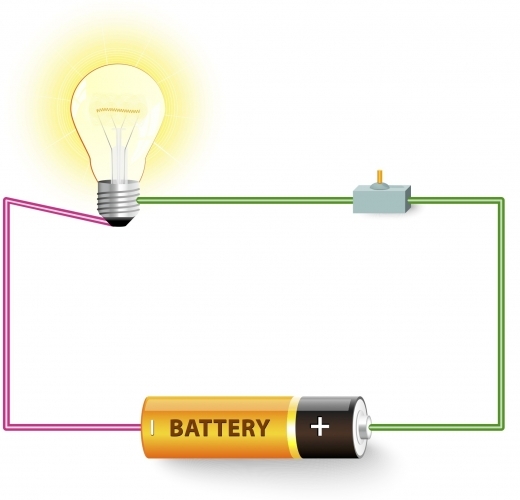 What happens in a series circuit when one light bulb breaks? What connection is used for Christmas lights? How can you make light bulbs brighter in a series circuit? 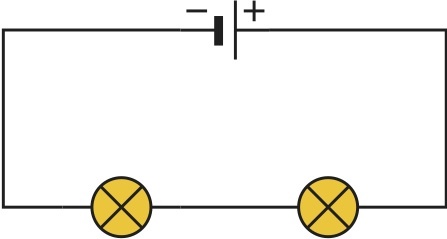 In a parallel circuit the current is the same along the circuit. In a series circuit the current is the same everywhere in the circuit. To symbolise three cells in an electrical circuit, you need to draw two cells next to each other. The main symbol for a light bulb is a circle with an X inside it. The statement is true. Series circuits are made of only one loop. 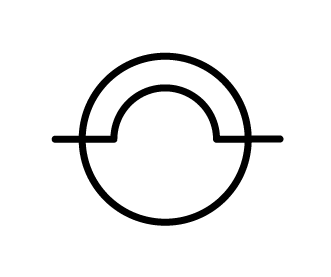 An ammeter is symbolised as a circle with an A inside it. In electrical circuits wires are represented as lines. When a light bulb breaks in a series circuit, the others stop working. Christmas lights are connected in parallel. If you take away some light bulbs in a series circuit, the others become brighter. This is false. In a parallel circuit the current splits into the branches. This is true. In a series circuit the current is the same everywhere in the circuit. This is false. To symbolise three cells in an electrical circuit, you need to draw three cells next to each other.